Can you really learn French through movies? Or is it just a convenient excuse for not doing your French homework? When I was studying French in high school, our teacher showed lots of movies. At the time, I thought the teacher was being a bit overefficient. Stick on a movie, keep half an eye on the class, and you can grade papers for 45 minutes without too much stress. In hindsight, though, I was doing my teacher a disservice. Watching French films helped me develop a feel for the rhythm and pace of spoken French, something that’s hard to get in a classroom when the only other people you’re talking to are similarly-baffled Anglophones. Additionally, watching French movies is a great way to put what you’ve learned into practice in a relaxed environment. If there’s something you don’t understand, you can always rewind and try to listen to it again, which is more than you can do speaking to an actual person. Trying to learn French through movies is also a good way to learn the kind of language that doesn’t show up in French textbooks. That doesn’t just mean slang and profanity – although you’ll pick up a thing or two if you watch enough crime dramas – but includes poetic language, subcultural jargon, and even everyday bad grammar. It isn’t enough to just soak up the vocabulary, though. Using a film to improve your French means watching it activelyrather than just sitting back and enjoying. To begin with, start by trying to watch the film without subtitles. If you hear an unfamiliar word, note it down. If you’re not sure what it is, use the French-language subtitles to get the spelling and article correct. Make sure you look up the words in a good dictionary and then review them on a regular basis. This is an effective approach, but like many real things in life, it is going to take time and energy. 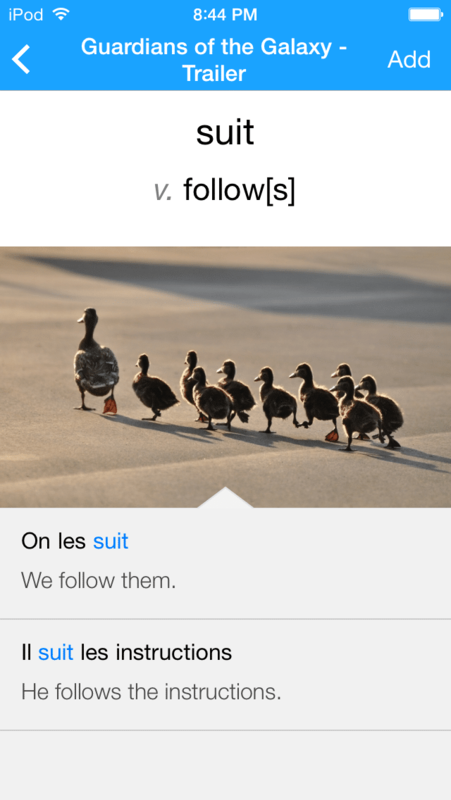 If you’d like to be even more efficient with this, and are open to watching other kinds of videos, you might want to check out FluentU, our site for learning French through videos. FluentU was designed to address exactly this problem. 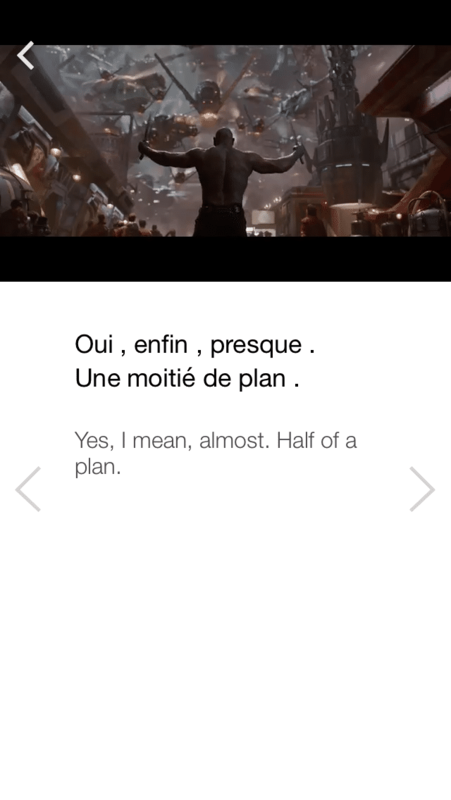 FluentU brings together great videos for learning French in one convenient place. 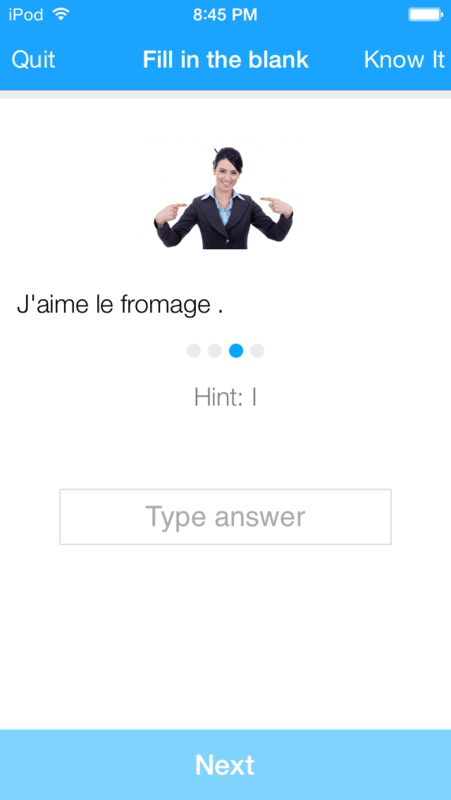 It also provides interactive transcripts and a video player designed for learning French. It tops this off with a review system which takes full advantage of the massive video library. And FluentU remembers your progress in learning vocab and uses it to recommend content from the rest of the FluentU library, which includes real-world videos like movie trailers, commercials, news, and inspiring talks. OK, enough shameless self-promotion. If you’re a beginner, you’ll probably want to select films with nice, uncomplicated French. If you’re a beginner, you might want to start with children’s films and simple fare like action movies. Fortunately, it’s been a good couple of decades for French children’s films and action movies. Some of these have had English-language releases which you may have seen, but others are less well-known. Back in the days of high school French, there weren’t a lot of options available to us. My French teacher used to arrange outings for the class to a little club that showed French films in a room at the community center. I definitely recall watching “Romauld et Juliette” and “Le Grand Blond avec une chaussure noire”. That kind of classic, light-hearted French comedy is a good way to keep the interest of students. As an added bonus, the plots are pretty easy to figure out from context. I had a good local video store – this was the 1980s, the golden age of video stores – and they had a pretty deep selection of foreign films. Still, when you’re a high school student you don’t exactly want to brush up your French using “Jules et Jim” or “The 400 Blows.” As a result, I took what I could get. When I moved to the UK, I gained a little more exposure to French animation, which is … interesting. Today, of course, the story is completely different. If you want a French-language film, even if you can’t find one on a streaming service or catch one on television, the internet has made ordering the movie you want on DVD basically effortless. Most major French releases will be available without too much difficulty. And if you have a multi-region player, the world’s your oyster. Obviously, you need to choose movies you’re going to enjoy (I mean, as much as anyone can predict that). I’m not sure the farces and romantic comedies that I watched as a student would be to my taste today, but on the other hand I’ll sit down and watch a weird steampunk fantasy like “La Cité des enfants perdus” any day of the week. Fortunately, there’s a lot of variety out there. I know everyone who’s ever recommended a French movie recommends “La Marche de l’empereur,” but that is because it’s really good. Released in English as “March of the Penguins” with a voice-over by Morgan Freeman, it’s very different in its original version. 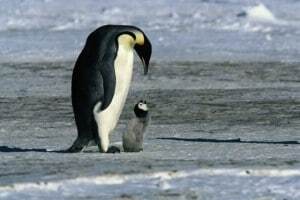 In the original, the penguins themselves narrate, with voice-over actors supplying voices for the mother, father and infant birds. It has everything the beginning French student needs: a relatively simple story, clear narration, and one voice at a time. You can spend some time with each narrator, letting your ear get used to it. 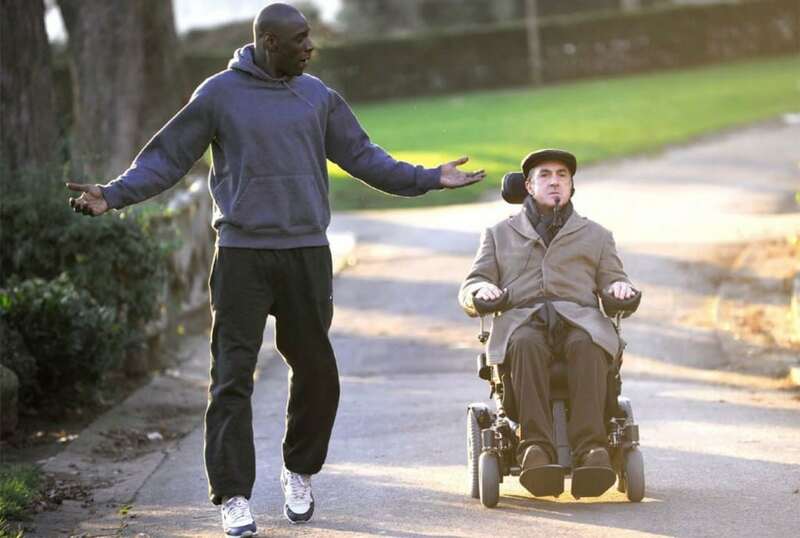 Whether you’re ready to fall off the couch laughing, cry a little on the inside, or all-out water your neighbors sweater sleeve with your tears, the French film “Les intouchables” will probably do the job. It’s an incredibly heartfelt and hilarious story about a young man whose anger at “the system” doesn’t stop him from applying for a position just to get a little unemployment insurance. He certainly didn’t expect to be offered the position of a personal caretaker for a quadriplegic aristocrat. Yet somehow, these two people of vastly differing backgrounds forge a powerful bond and both seem to give new purpose to the other’s existence. But it isn’t only the story that is so compelling, the language too is full of the delightful contrast that results from characters of two quite disparate socio-economic circles. The protagonist’s almost crass and up-front way of talking really gives a sense of what French sounds like in the streets, among friends, and in heated conversations. But his friend’s impressive vocabulary, clear and proper articulation, and formal expressions demonstrate another side of the rich French language. You’ll also gain a sense of appreciation for what happens when these two ways of speaking the language collide. What is appropriate to say in a job-interview setting? What does a brother say when he’s angry and worried about his younger sibling? How do you yell at an annoying sibling, or punish your daughter? How do people speak to each other in the work place? You will be amazed at how much you’ll learn and how much you’ll love “Les untouchables“! There’s been a boom in French action movies over the last few years, partly driven by media enthusiasm for parkour, the hyperkinetic French sport-slash-artform and by the success of director/producer Luc Besson. 2004’s “Banlieue 13,” a dystopian action thriller with a surprisingly idealistic ending. Sometimes it may be hard to work up the courage to throw in a movie in a foreign language, but nothing is more motivating that knowing you’re going to blow up from laughing (“éclater de rire“… did you catch the frenchism?). 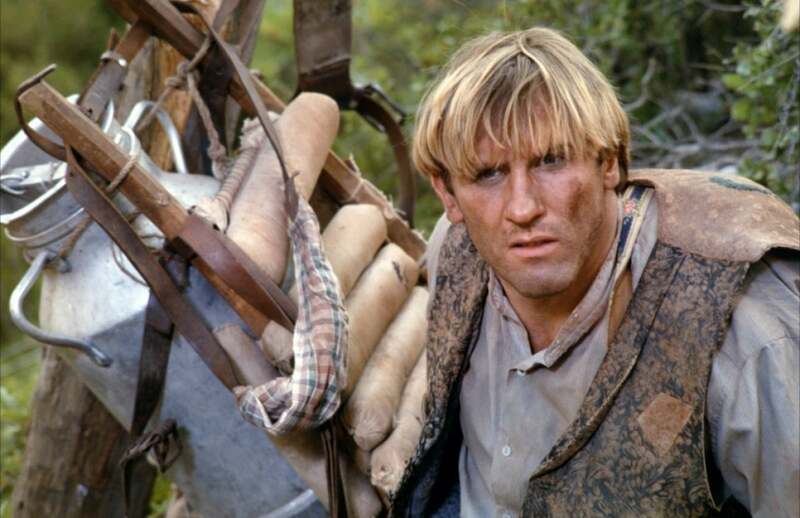 A great film for doing just that is “Les visiteurs,” a cult classic for many French people. 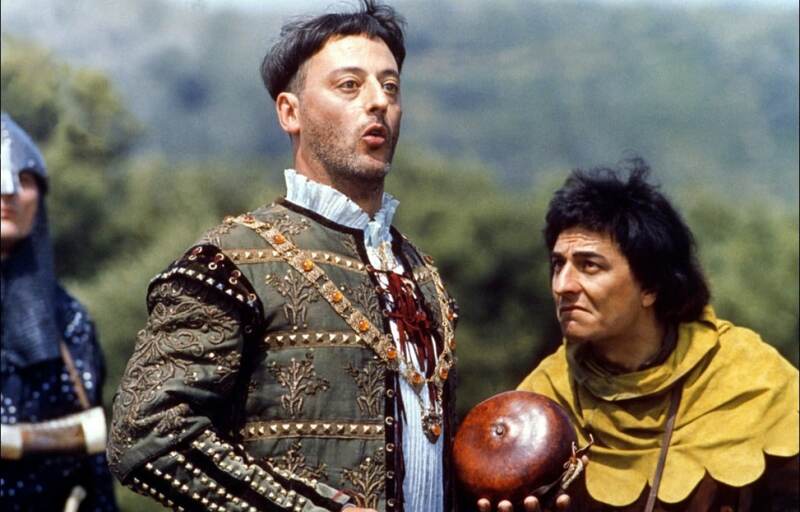 Jean Reno and Christian Clavier are a knight and his squire from the medieval times who have been transported into the future (not quite to the present day, since the movie came out in 1993). They must find a way to return, running into their great great great great… … … great great grand-daughter along the way. (Ok, maybe it’s not the most original-sounding of plot lines, but it’s probably one of the better made “time-swap” films)! It’s an absolute riot to watch these two brave, but slightly smelly and unkept men, struggle to face the horrors and silliness of modern times. Listen also to the distinct way the two medieval characters talk compared to the other French characters. You’ll no doubt come across some wonderfully outrageous medieval expressions and struggle, right along with the characters, to figure out what they are talking about! The next time you’re in France, you won’t have much trouble finding someone who will recognize quotes from a movie like this! 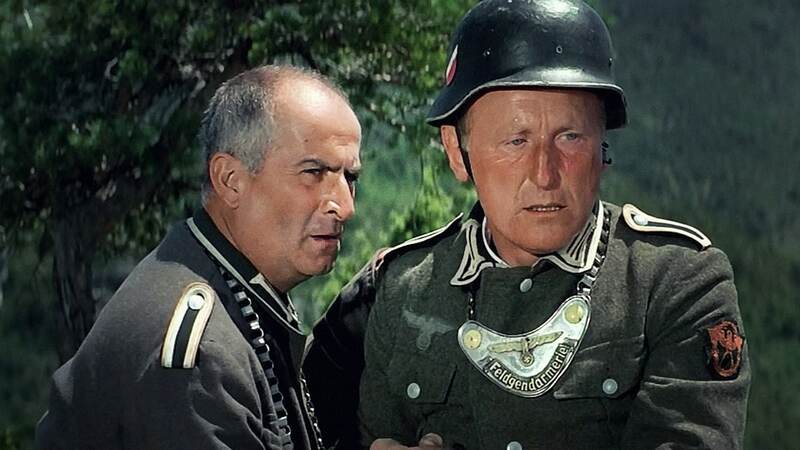 Perhaps one of the most quoted films in France is the World War II classic: “La grande vadrouille.” This story of international camaraderie in wartime, is one that many, who knew France at the time, connect with. It characterizes the particular way in which some French people think about Americans and the English. The French characters in the film will stop at nothing (despite sometimes lacking in motivation and conviction) to help the American and English soldiers that have parachuted into Paris and must get south and out of the German-occupied part of the country. The movie plays on stereotype after stereotype and cliché after cliché, making this movie a gem of cultural insight. You’ll learn a lot from the characterizations of the different nationalities and the interactions between them, though perhaps considerably less about how to be inconspicuous in an occupied war-zone! Embarrassing as it might seem, children’s films are among the best choices if you want to learn French through movies. They tend to have simple, straightforward plots that are easy to work out from context, and the dialogue is usually clear, with limited vocabulary. Simple doesn’t have to mean boring, though: check out “Kirikou et la Sorcière,” a 1998 animated film based on West African folklore. Successful enough to spawn two sequels, Kirikou has simple enough dialogue for beginners but draws on a setting and mythology that are rich and new enough to hold the viewer’s interest. Musicals are another way of getting a grip on the language. This seems to be variable; some viewers find it harder to follow a song than to pay attention to dialogue, while for others the music actually makes the words easier to understand. If you want to find out which applies to you, you should start with 1964’s “Les Parapluies de Cherbourg,” a romantic drama starring Catherine Deneuve in which every line is sung rather than spoken. Recent releases of the film restore the original vibrant colors. It’s a very unusual film, well worth the time not just as a learning tool but also as a movie. If you’re in the mood for a movie that will lift your spirits in the most bizarre way, you’ll love “Du vent dans mes mollets.” This sweet film deals with the familial dramas of a rather eccentric family that is, at the same time, so very relatable. 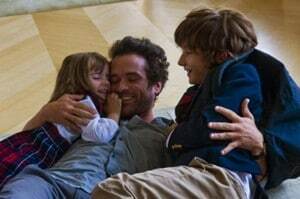 The young girl deals with growing up in a world that doesn’t understand her nearly as well as she understands it, all while her father searches for the happiness he once found in his marriage and her mother struggles to rediscover her womanhood and her motherhood. This film is great for learning French because the movie is all about figuring things out and explaining them. You’ll be able to figure things out along with the characters and with their help too! You’ll truly feel like you’re getting to know the people in the film and get to “live” with a French family in a wide variety of day-to-day situations. Honestly, it’s hard to ignore a film that claims to make you feel and learn so much! For those for whom French is the language of romance, who can ignore the wide world of romantic comedies?L’arnacoeur (“Heartbreaker”) stars Vanessa Paradis and Romain Duris for a light, heart-warming comedy that follows the standard rom-com formula enough so that the story is easy to follow, while adding an interesting twist that will keep you hooked. What happens when a man whose job is to break up unhappy couples actually falls in love with one of his unsuspecting clients? A lot of of laughs and tears, apparently, and plenty of winks and nods to the reigning champion of all rom-coms: Dirty Dancing. Before “Glee” started filling up high school choir rooms with burgeoning stars, “Les Choristes” captured the hearts of the French. It is the timeless tale of the the arrival of a new teacher at a remote boys’ school in post-WWII France. With disciplinary problems rampant, and the policies of the strict, old-fashioned headmaster not helping, Monsieur Mathieu decides to introduce choral singing as a way to bridge the gap with his students. The songs from Les Choristes will stick with you for days at a time, and you might even be tempted to download the soundtrack to sing along yourself! The main goal of many people studying a second language is to eventually go to a country where the language is spoken, whether it be for tourism, work, or study. “L’auberge espagnole” tells the story of a recent college graduate who decides to spend a year studying in Spain to brush up on his Spanish before moving on to the corporate career that his family has planned for him. We accompany him in his emotional ups and downs as he adjusts to a new culture, new friends, and navigates his relationship with the girlfriend he has left behind in France. This 2002 movie is the start of a trilogy featuring the young Xavier from his early years into adulthood with “Les poupées russes” (2005) and, the recently-released “Casse-tête chinois” (2013). Don’t underestimate the value of a good film. Movies helped keep me focused on French as a student, and they’re about the only way I keep my French in shape today. One of the most epic and beautiful stories I’ve ever seen on the screen has to be “Jean de Florette” and its sequel “Manon des sources.” This sorrowful film from Claude Berri tells the tale of a couple of men from southern France who discover the presence of a water source (more valuable than gold in that hot dry region) on their neighbor, Jean de Florette’s, property. They conceal the existence of the spring and sit back as their neighbor works himself to death on the land they know will not yield enough crops without more water. Dramatic and moving scenes from “Jane Eyre” and “The Great Gatsby” come to mind as you watch the life of an honest man waste away in the wake of greed and covetousness. In the sequel, Manon, the daughter of Jean de Florette, has discovered the source and seeks revenge for her father. This classic and powerfully moving French story is a diamond of French culture and will give you a glimpse of some regional variations in the French language, vocabulary, and accent. If you’re used to hearing the French spoken by textbook writers or Parisians, test yourself with this alternative example! FluentU has interactive captions that let you tap on any word to see an image, definition, and useful examples. FluentU brings native language content within reach. You can learn the vocabulary in every video with FluentU’s “learn mode.” Swipe left or right to see more examples for the vocabulary you’re learning. And FluentU always keeps track of your vocabulary words. It uses that vocab to give you a fully personalized experience by recommending you videos and examples. Start using FluentU on the website with your computer or tablet or, better yet, download the FluentU app from the iTunes or Google Play stores.